Our Creative Nature Hemp Protein Powder is a known source of Omega 3, 6 & 9 and offers an easily digestible, rich plant protein alternative to whey protein. It’s soya and gluten free and is perfect for the repair and building of muscle. 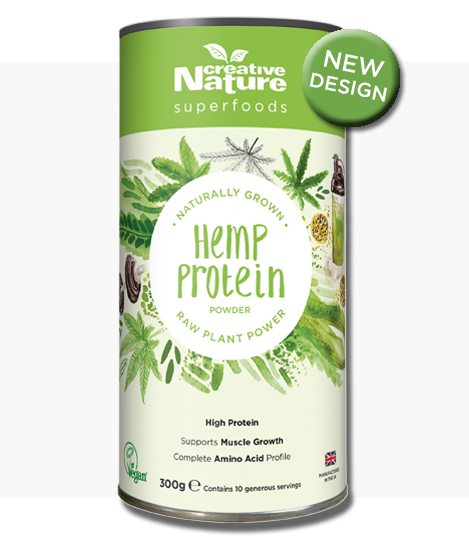 Hemp Protein Powder at Creative Nature Superfoods, the hearty hempseed giant of the protein world is harvested from one of the most versatile plants on earth, here in Great Britain. Hemp is one of the most versatile plants available and it is also very nutritious! Not only are shelled hemp seeds a great choice for anyone aiming to increase their healthy fat and protein intake, but this Creative Nature Hemp Protein Powder makes reaching your Protein intake goals even easier! Athletes are often recommended to consume around 20g of protein soon after a workout to ensure proper muscle recovery and repair, however consuming a meal with such an amount of protein can often be difficult. Most Protein powders out on the market nowadays are from Whey, meaning they contain dairy and may cause digestion problems to those that are intolerant. 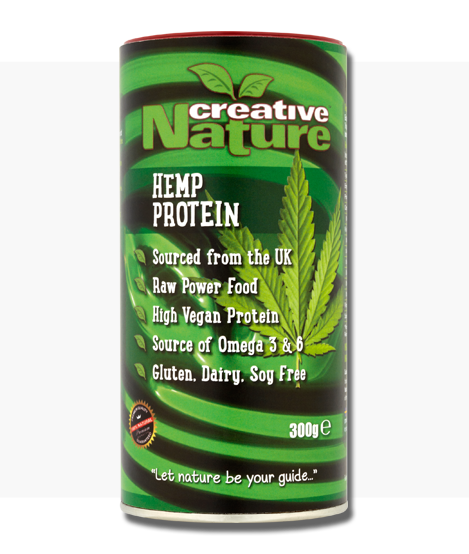 Creative Nature Hemp Protein Powder on the other hand is dairy free and vegan, meaning it can be enjoyed by pretty much anyone as it will not cause discomfort and is cruelty free! Mix this beautiful Hemp Protein Powder with milk or a milk alternative of your choice or add to a post-workout smoothie for the perfect recovery shake! Ingredients: 100% Hemp Protein powder, and that’s all! Our Hemp Protein Powder is your perfect Gym Buddy! Take it in your bag to enjoy with a smoothie after a workout or add to recipes at home and make some yummy, healthy and protein-packed creations! Hemp protein has been a staple in my pantry for many years, especially when I chose to cut out most animal proteins from my diet. In my view, Creative Nature’s hemp protein is the most superior in terms of quality and taste. I add hemp to my bowl of oats everyday, along with Creative Nature’s organic raw cacao and maca powder (two other fantastic & extremely nutritious superfoods). The immediate boost of energy, strength & wellbeing I get from my turbo-charged breakfasts last for 6 hours non-stop! 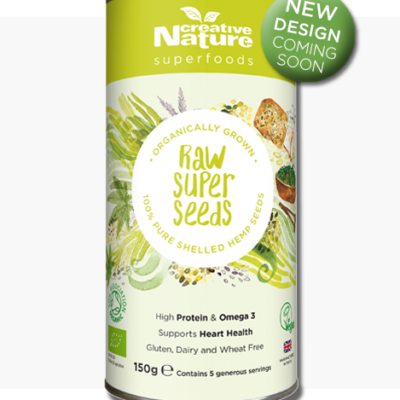 So thank you Creative Nature for responsibly sourcing & providing high-quality ingredients. A toast to health & wellbeing!! !